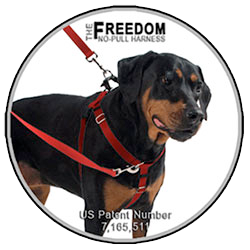 What makes the Freedom No Pull Harness Different? Designed to minimize/eliminate pulling without placing pressure on the neck, the Freedom No Pull Dog Harness is an effective tool utilized to walk your dog with comfort and confidence. The Freedom anti pull dog training harness has received top reviews because the back tensioning loop allows you to train and communicate while walking your dog. The Freedom No Pull Harness is recommended as on of the best dog no pull dog training harnesses by top trainers from Whole Dog Journal, Good Morning America Veterinarian Consultant, Dr. Marty Becker, and utilized by Victoria Stilwell on both Animal Planet's It's Me or the Dog and Anderson Cooper. As the designer and inventor of the Freedom No Pull Harness, I want to provide you the best shopping experience with the best prices possible. I invite you to browse through our store and shop with confidence. Create an account with us if you like, or shop as a guest, either way, your shopping cart will be active until you leave the store.